If you are reading this article, you’re either studying Japanese or craving to start. Therefore, I have to congratulate you! Not everyone has the necessary strength to learn such a different language. This is an important step regardless of the language you want to learn. You have to make your brain get use to the sounds of it and you’ll be happy to hear that this step can be fun! Do you like watching TV series? If so, why not watching some great Japanese series? That way, you’ll have fun and get use to the language at the same time. JapanesePod101 – It is one of the best podcast series for learning Japanese. It provides almost three thousand audio lessons and video tutorials with a clear pronunciation that is quite easy to understand. News In Slow Japanese – Each week, a topic is chosen and discussed in a simple, clear Japanese, reading it in a slow pace so you can understand each word. A range of topics are covered, such as entertainment (movies, internet, manga), sports, news and culture. This is great for you to enhance your vocabulary. The website also provides popup translations for difficult words and readings of the kanji. Japanese LingQ – It provides thousands of hours of conversations in real Japanese through the format of interviews, features and audiobook excerpts, covering a wide range of topics. Listening to the podcasts is free, but you can also pay for a membership in order to enjoy other features like flashcards, vocabulary lists, progress trackers and web browser extensions. Learn Japanese Pod – Their podcasts are informal and usually just short conversations between Alex and Asuka, a native from Japan. Then, the two of them explain in English what was said to help with your grammar vocabulary and scripts of the conversations are provided. Besides podcasts, you can also listen to Japanese music, watch a Japanese news channel or read mangas. The important thing is that you surround yourself with the Japanese language so it becomes familiar to you. Hiragana is the basic Japanese phonetic alphabet. Learning it may seem a difficult task at first, but it is a very important step for achieving Japanese proficiency. Why? Because the 46 basic hiragana symbols represent every sound of the Japanese language and they are used for modifying the meaning of kanjis (we’ll see more about them below), adding grammatical structure to sentences (okurigana); showing the pronunciation of unusual kanjis characters (furigana) and writing words that don’t have kanjis of their own. How can you learn this different but important alphabet? 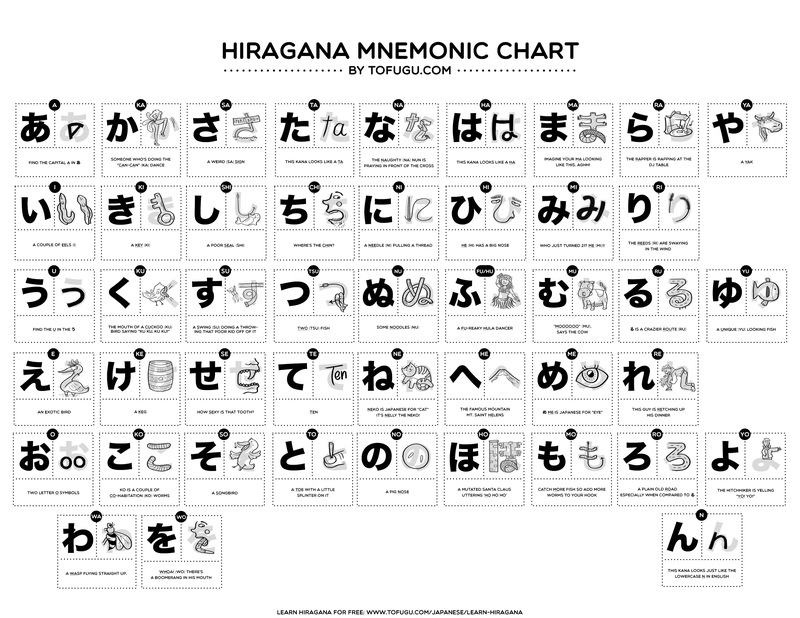 An easy way to do it is by using mnemonics, images that serve as a memory aid and help you remember the hiragana symbols. After that, do a lot of exercises to really imprint those symbols in your brain. A fun way of doing that is by playing games that you can find on the Internet. Rosetta Stone uses the immersion method, teaching you new words and simple sentences and then asking you to repeat them. Using their speech recognition technology, the program assess your pronunciation. They also provide live tutoring and an online community with games and activities to help you practice what you learn. Pimsleur focuses on a “learning by listening” approach, providing audios of basic conversations among native speakers for you to get use to the language and then repeating what you’ve heard. A great advantage of Pimsleur is that you can listen to the audios while doing your daily tasks, such as commuting to work or cleaning the house. Another great help when you’re a beginner is to use a good dictionary. You can either use it when you want to know how to say a specific word in Japanese or you can use it to study grammar or enhance your vocabulary. Regardless of the language you are studying, speaking will always be an essential step to achieve proficiency. It is normal for a beginner to feel afraid of speaking and focusing primarily only on writing and reading. Don’t make that mistake! When babies are learning their parents language, they don’t start by reading books about it; they start by simply listening and speaking. So even though studying the basics obviously has its importance, don’t refrain yourself from speaking and even making mistakes at first. It’s part of the learning process. How can you practice your conversation skills? If the opportunity of living in Japan presents itself, it would be a great way of doing that. However, it is wrong to assume that this is the only way of really learning how to speak Japanese. In fact, many people who went to Japan to do exactly that later had to admit that it isn’t as simple as it seems. First, because many people will want to speak English with you and second, because you won’t be able to follow complex conversations at first and that could be frustrating. Therefore, if you can’t move to Japan, don’t think that you won’t be able to practice your Japanese. You can do that with the help of online tutors, for example on Preply, Italki and Verbalplanet. What are some advantages of online tutors over a regular language school? First, the price. You can find online tutors with an hourly rate of 15 dollars. It goes without saying that you would spend much more to attend classes in a regular language school. A second advantage that makes the first one even greater is that while in a regular school you have to share the teacher’s attention with other students, the online tutor will focus only on you the entire time. A third reason why online tutors are better than attending a regular language school is the time flexibility. With the tutor, you can set the date and time of your preference, instead of having to depend on the schedule of a school. You can even study at night or during the weekends, in the comfort of your home. I don’t have to say anything else to convince you, right? What if you can’t afford online tutors? Don’t lose hope because there is a great way of practicing your Japanese for free. Yes, you’ve read correctly: for free! I’m talking about a language exchange. Do you know what that is? On websites like Meetup, The Mixxer and My Language Exchange, you can find Japanese speakers that want to practice their English. So you can set a Skype video call with them and talk half of the time in Japanese and the other half in English. Of course you will have to “waste” half of your time to help the other person to practice but hey, it’s free. It doesn’t matter if you choose online tutors or a language exchange, the important thing is to practice your conversation skills by speaking with natives. This will help you to develop the correct accent from the beginning and this is super important because the pronunciation is an essential part of learning a language. Kanji is a writing system of the Japanese language. This may sound weird because we have already talked about hiragana, but Japanese actually has three writing systems: hiragana, katakana (used for writing foreign words) and kanji. The main difference among them is that while hiragana and katakana merely represent sounds, kanji is a system of symbols that represent words or ideas. A kanji can be either a word by itself or can be modified by a hiragana character to form another word. Nobody knows exactly how many kanjis are there, but surely there are more than 50,000 of them. Hold on, don’t start thinking that you will never be able to remember all of them and that even if you did, it would take you too long to learn Japanese. Don’t give up just yet! The truth is that you don’t need to remember all of them. “Only” about 2,000 kanjis are considered common in daily use. First of all, why should you bother learning kanji if it’s not a requirement to speak Japanese? Because knowing kanji will enable you to read in Japanese and it will also help you to know the meaning of new words. The same way that English has prefixes (im- meaning “not” and pre- meaning “before”, for example), and suffixes (such as -less meaning “without” and -ward indicating direction), each kanji has its own meaning and by knowing them, you can better understand new vocabulary. How can you learn and remember over two thousand kanjis? Don’t bother trying to memorize kanjis as a whole or learning stroke by stroke. It will take you a long time and it will be a painful experience. Heisig’s Remembering The Kanji – This book will teach you how to assign an identity to each kanji so when you look at them, you will see pictures and remember their meaning. This is the mnemonic method we discussed above. Anki – This program uses flashcards and the space repetition method to help you better remember the kanjis you’ve learned. Try to learn five different kanjis each day, putting them in the flashcards and trying to remember them the next day plus learning five more kanjis. The program will analyze which kanjis you’re struggling more with and will show them to you more often so you can memorize them. Check AJATT (All Japanese All The Time), a website that teaches you to study Japanese by yourself, with the help of flashcards and native Japanese media. This method will teach you how to write, listen, read and speak Japanese without having classes. By the way, AJATT uses the two tools mentioned above: Heisig’s book and Anki. It also encourages you to do immersion, which is surrounding yourself by as much Japanese as possible. On AJATT table of contents you can verify that this is a very complete method. You may now be wondering: how long does it take to learn Japanese? This is a complex question because it depends on multiple factors, such as how many hours you are willing to spend per week, your prior language learning experience and what are your goals, in other words, how much Japanese do you want to learn. The important thing is that today we’ve learned that the best way to learn Japanese is the combination of five different tips: getting use to the language by watching TV series and listening to podcasts, learning hiragana with mnemonics, using Pimsleur and Rosetta Stone to learn the basics, talking to online tutors, and learning kanji. If you liked those tips, be sure to subscribe to Mimic Method’s Youtube Channel to get many more cool tips like these! Best of luck on your Japanese studies!